Silken Park in City West has been the first private development to achieve the Home Performance Index (HPI) label. The houses were built by Durkan Residential and meet key HPI criteria on water efficiency and daylighting, as well as being Passive house certified. The certification of Silken Park coincides with the launch of the Home Performance Index Website, meaning that Home Buyers will be able to find quality sustainable homes listed in the one place. The Home Performance Index label was developed by the Irish Green Building Council (IGBC) after extensive research and consultation with the industry to encourage quality and excellence in the development of new homes. The HPI certificate demonstrates that the home has been designed and constructed with care to ensure low running costs, enhance the health and well being of the occupants and minimise environmental impacts. The label also allows housing providers and private developers to highlight the quality and sustainability of their homes to occupants, investors and home buyers. Read more. Water efficiency – Do we realise its real impact on carbon emissions? In the absence of strong water efficiency regulations it is easy to overlook specification of water efficient fittings. With rain bucketing from the skies in Ireland, water has tended to be considered much less important than energy efficiency. However water treatment was one of the highest sources of carbon emissions for local authorities, and hot water can now be the highest single source of energy use in homes built to current Part L energy regulations. If you consider that the least efficient showers use well in excess of 26 litres of hot water per minute, as opposed to 3 litres for the most efficient, you can understand how this could have a dramatic impact on energy use. Indeed the fact that hot water is responsible for up to 80% of regulated energy use in apartments ( apartments have very low space heating requirements as surrounded by other apartments) will see the introduction of a credit in the DEAP software in the revised Part L building regulations which come into force in 2019, where flow restrictors are fitted to showers and taps. This also allows the BER assessor to input the actual water usage data for the taps and showers specified. Luckily it is now very easy to specify and calculate water efficiency in homes. 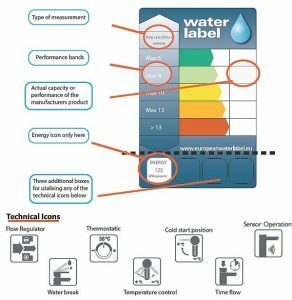 The Irish Green Building Council are scheme partners with the European water label ,which provides a label for water efficient fittings and fixtures just like the rating system for electrical goods. This contains data for most of the leading manufacturers of sanitary ware. It also provides a water calculator to assess the impact of the fittings on overall water usage in the home, just like the Building Energy Rating (BER) rating system does for energy. This allows the architect or specifier to use the drop down menu to pick specific products, which makes it very easy to calculate whether the benchmarks in the HPI have been met or whether alternative fittings need to be chosen. This means that for architects it is simply a matter of searching for the most efficient fittings or better still if short on time asking the supplier to provide a sanitary ware schedule that meets the target benchmark within the Home Performance Index. This is what HPI intends to do, simplifying life for all by bringing state of the art tools to measure all the key performance indicators for quality housing. For more infomation on the European Water label and to access the calculator see here. Dublin City Council sets new standards for excellence with its social housing. Thursday, 6th October – A scheme of social housing has been the first to achieve the exacting Home Performance Index (HPI) label. The block of apartment at Rathmines Crescent was built by Dublin City Council and designed by its own architects. The label allows housing providers and private developers to highlight the quality and sustainability of their homes to occupants, investors and home buyers. The Home Performance Index label was developed by the Irish Green Building Council (IGBC) after extensive research and consultation with the industry to encourage quality and excellence in the development of new homes. The HPI certificate demonstrates that the home has been designed and constructed with care to ensure low running costs, enhance the health and wellbeing of the occupants and minimise environmental impacts. 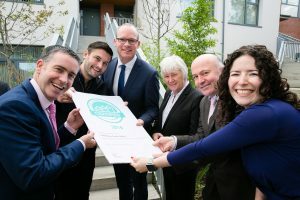 The certificate was presented to Dublin City Council by Minister for Housing, Planning and Local Government Simon Coveney TD and Pat Barry CEO of the Irish Green Building Council today. Pat Barry CEO of the Irish Green Building Council stated. 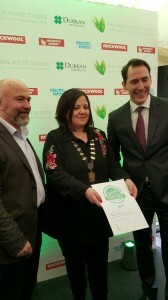 “ We are delighted to award the first certificate to Dublin City Council for social housing, as this demonstrates sustainability is about skills, choices and design and not about additional cost”. Mr Barry added: “It is important that we are all working to a quality sustainability standard for new housing in order to protect home buyers and the environment. This also demonstrates that sustainable housing have a role to play in enabling active healthy communities”. Reacting to the Comments, Minister Coveney said: “Energy efficiency should be at the heart of all our building projects. It is important that we build all our social housing to the same quality in terms of energy efficiency and design as we saw here this morning”. Sustainability labeling schemes such as HPI have become increasingly important for banks when assessing mortgage default risk, with the European Mortgage Federation recently announcing the intention to develop a Green mortgage product which could allow Irish Banks to offer discounted mortgages to homebuyers of certified green homes. A number of leading Irish developers are currently vying to bring the first privately built HPI certified homes to the market.